Students live in Lassen, Plumas, and Sierra Counties. Ages vary from the very young to adults. It is not necessary for students or their families to have previous experience with horses. Disabilities served may include: ADD or other Hyperactivity Disorder, At Risk Youth, Autism, Cerebral Palsy, Developmental Delay or Disability, Emotional, Behavioral or Mental Health, Hearing Impairment, Learning Disability, Mental Retardation, Muscular Dystrophy, and Speech Impairment. 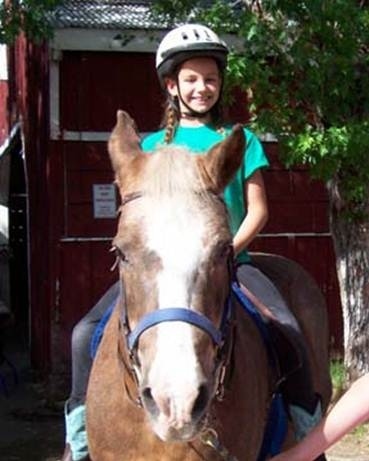 Activities may include: Grooming, saddling and bridling, leading horse, and other ground work, mobile community programs, recreational riding, therapeutic riding, vocational training. The educational setting includes instructor reinforcement of math, spelling, counting, or color issues during horseback riding lessons. Other issues are addressed depending on the individual needs. Student recruitment begins in the spring. Referrals come from school programs, occupational therapists, physical therapists, head-start programs, and of course, any parent who feels that horseback riding and being around horses in a learning environment could help their child. Contact HUI about enrollment possibilities. Those who rode in the program the previous year are welcome to participate again. The student enrollment process involves three to four pages of paperwork. Registration forms cover the program requirements; including the Liability Release, Photo Consent/Non-Consent, Fee Schedule, and Policy for Unexcused Absences. Each student must have completed Riders Medical History and Physicians Statement forms on file; including a signature by his/her Healthcare Provider insuring that horseback riding is a safe activity for that individual. This form also notes whether there are any issues that should be addressed in the individualized lesson plan. Examples might be: the effects of medication, seizure disorders, low tolerance to sunlight, low blood sugar problems, fatigue, or the need to wear prosthesis for support during riding lessons. All records are kept confidential; volunteers have signed a Statement of Confidentiality. The interview with the individual and/or their family comes next. This meeting helps the instructors gather information to create appropriate goals for the lessons. It also helps for choosing the right horse, and how many volunteers will be needed to assist the student. The source of payment for a session would be discussed at this time. Individual Costs: $360 per session: includes 8 - 1 hour lessons @ $45 each. More lessons may be added as space or money is available. (Some sponsorships may be available).